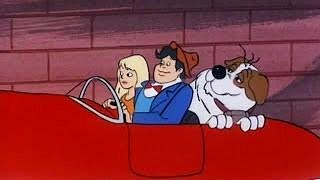 This mystery comedy cartoon featuring the bungling, Tom Thumb-like detective was produced by Hanna-Barbera, and originally aired for one season on NBC from September 8th 1973 to August 13th 1974. It was shown on Saturday mornings and there were 13 episodes in total. The cartoon also aired again during the 1980s on several cable TV channels. I remember watching this here in the UK, too, although I am struggling to find info on when it was shown, and on which channel. 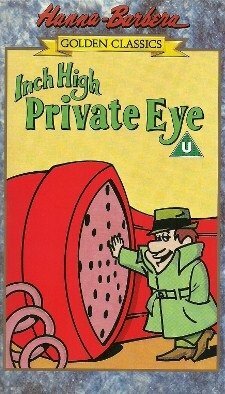 After watching the clip above (the first time I've seen the cartoon since my childhood) a whole array of memories that had been stored in my brain for decades suddenly re-emerged - in particular, the sound of the characters voices and the theme tune. 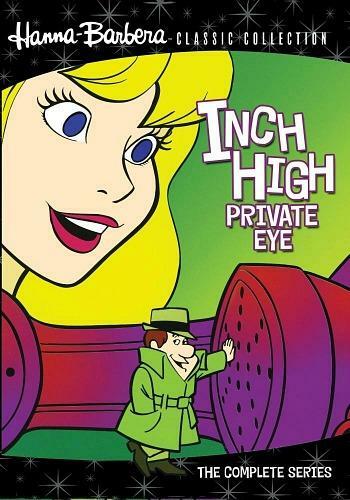 Described as "the world's biggest little detective" in the opening titles, and as his name suggests, Inch High was indeed an inch high in height. Helping him to solve each mystery were his normal-sized companions. There was his clever and pretty niece Lori (who addressed him as "Uncle Inch"), the musclebound Gator (he was a bit of an oaf and always wore a large, brown hat on his full head of black hair) and very loyal and ginormous St. Bernard dog Braveheart. You may remember they all drove around in the futuristic and aptly-named Hushmobile (it was a completely silent hover car), which looked rather like either a shoe or a dodgem car - possibly a hybrid of both! Inch Eye worked for the Finkerton Detective Agency (a play on the real-life Pinkerton Detective Agency). His boss, A. J. Finkerton, found him irritating and dreamed of sacking him. If you think you've heard Lori's voice somewhere before then you're not mistaken. She is voiced by Kathy Gori who also voiced Rosemary the telephone operator in Hong Kong Phooey. Inch could often be seen on the end of Braveheart's nose trying to get a better view of the area around him. He also went undercover by disguising himself as part of Lori's jewellery or hiding in her purse. He could contact her through the compact-phone, a portable phone disguised as compact make-up. This gadget seemed very futuristic at the time and was long before the mobile phone was ever invented, of course. Boss Finkerton's wife also made an occasional appearance and she was voiced by Jean Vander Pyl who is best-remembered as being the voice of Wilma Flintstone. There is no doubt that the tried and tested concept of this cartoon (teenagers and a dog setting out to solve a mystery in each episode) was borrowed from Scooby-Doo, Where Are You?, although it still had many original ideas that set it apart from other cartoons from the era. As with most HB animations, this was absorbing, fun and colourful and very innocent compared to many of today's cartoons.